While the world and its cousins were all talking about the sad news of Rajesh Khanna’s demise, Yahoo also ran this rather random, and well, poignant news report on actor Satish Kaul that I am sure most of us would have missed. For those who don’t know, Mr. Kaul was the A-grade actor in B-grade films like Kabrastan and Khooni Mahal and the B-grade actor in A-grade films like Karma and Ram Lakhan. 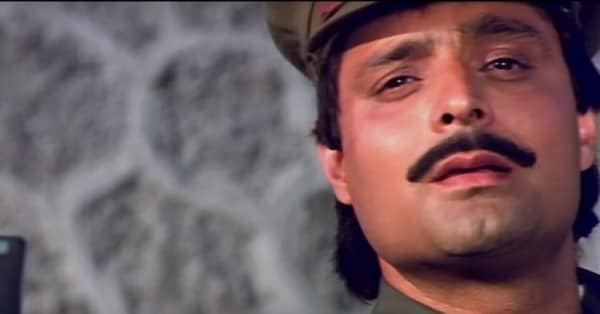 His duet with Rama Vij in Bahu Beta aur Maa is a great lesson for the film actors of generations-to-come on how to emote through an entire love song while suffering from acute constipation, mouthing lines like Dhaga ragon ka sui mein piro ke button laga doon oh meri sajni oh soniyoe. Amongst his more popular roles, he played one of the dead sons of Dilip Kumar in Karma. Apt. Also, his dead brother in the film was Shashi Puri, another actor born to fill the pages of a respected forum like ‘I love trashy hindi movies’, but we shall reserve that for some other time. Mr. Kaul was found rather dashing in gaudy costumes, and he played Madhusudan, Yuvraj Anandsen, Yuvraj Ajay, Yuvraj Vajramukti, Suryamal and many more such characters that would continuously wet Ramanand Sagar’s ornamented underpants in serials like Vikram aur Betaal and Dada Dadi Ki Kahaniyan on Doordarshan. From what I remember, he also played the bit role of the over-the-top filmstar in Aziz Mirza’s TV serial Manoranjan, again, on DD. Apparently, Mr. Kaul, after working in 60-odd Hindi and Punjabi films (Amongst other movies, he was also the hero of Munda Naram Te Kudi Garam. Respect.) and running a film school (the ad on OLX mentions he has done close to 300 films, btw), is now going through some very rough times. And since he has no place or family to go back home to, he just got himself and all his trophies collected over the years from organizations like City Club, Jalandhar and Agarwaal Mahasabha, Bulandshahar, checked into some Red Cross Senior Citizens’ Home in Ludhiana. Quite a moving story, this, because it really is painful to see old actors, dyed hair, wrinkled skin, rusted trophies, et al, trying to live what was but no longer is. No matter howmuchever bad they were as actors. BUT this is where the Yahoo report turns rather arbitrary and funny and actually starts begging for a place of its own in any forum dedicated to all things trashy. I quote from the report: “But the question is what’s the reason behind this situation? Copyright! Our country is quite very lenient on copyright laws, and hence, it leads to this. Injustice, right? So what’s the solution? A strong copyright law that gives due admiration to all”. PS: Whoever has given the VO in this report, you are my dream girl. I would love to give you due admiration some time. Quite very lenient I am. Promise.